Laura Costello, Director of the City's Land Reutilization Authority (LRA) spoke tonight to the Preservation Board asking for a 6 month extension from demolition for the green painted flounder house at 3533 Missouri Avenue. The house had been condemned for demolition by the Department of Public Safety last September. She said the LRA would like to do some special marketing for the house to find a someone to rehabilitate it including placing it on their Featured Properties List. The 925 square foot home is located in the Benton Park National Register Historic District, making it eligible for Historic Rehabilitation Tax Credits. The unusual rear of the lot frame flounder is listed in the City's real estate records as being built in 1884. The Preservation Board voted to approve the extension. Next, though the Preservation Board approved the demolition of 5148 Enright against the Cultural Resources staff recommendation. While as Cultural Resources Office Preservation Planner Bob Bettis testified the porch of this house needs some attention, the home itself is structurally sound without major damage. The Preservation Board agenda for the home shows an analysis of rehabilitation cost after factoring in Federal and State Historic Tax Credits at $112,200.00. The house is a contributing property in the Mount Cabanne - Raymond Place National Register Historic District. 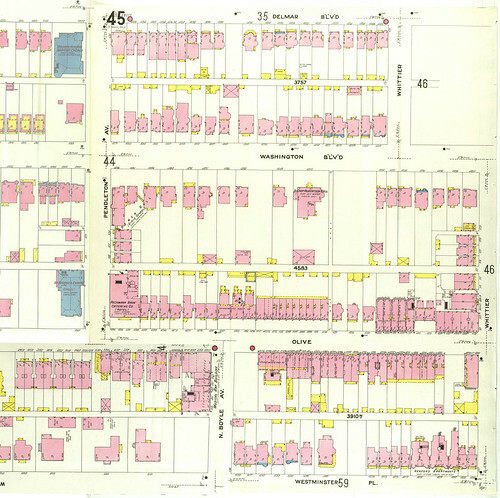 18th Ward Alderman Terry Kennedy however testified in favor of demolition, stating that since the house to the east of 5148 Enright (vacant lot shown above) was demolished after an arson fire, and this one would probably be next in line for an arson fire. I'm not sure how this claim can be pointed at this house and not every other vacant home in the area? He did mention that the owner of the occupied home next door is having problems getting insurance. Again though, I find it hard to believe that no one would insure this owners home and this could theoretically be claimed as a reason to demolish every vacant house next to an occupied house in the City. None the less, the Preservation Board voted for demolition. The Preservation Board also voted to allow the demolition of a Mid-Century Modern building at 3663 Forest Park upon the application of a building permit for a new five story Best Western hotel. The board wisely chose to hold the building permit requirement as recommended by the Cultural Resources staff. The developer tired to claim that a survey of the property could not be done without demolition of the building, but even Richard Callow, one of the few non-architect or engineers present called this bluff. The design of the new hotel, while much better than what had been originally proposed in 2007, seems to have been downgraded from that shown last year in this Central West End Midtown Development report. I'm a big fan of old photographs of St. Louis, particularly street scenes. I recently came across a link to search the image archives of Life Magazine through Google, and of course searched St. Louis. Beyond many fashion shots in WU's quad (which are fascinating), baseball, the zoo, Veiled Prophet, etc., a few images of major debris in the streets caught my eye. The images are simply labeled "St. Louis Tornado". 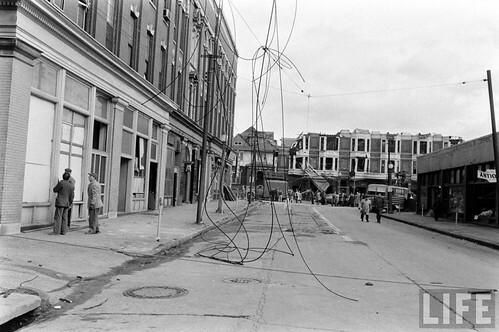 The intersection above would otherwise have been almost unrecognizable, but my knowledge of the patterns of devastation brought by major tornadoes through St. Louis history told me that this must be 1959 and somewhere around Gaslight Square. Everything visible in the first image has been gone since before my memory, so while I knew the general location, placing the intersection did not come immediately. After looking at a few more images, I recognized I recognized a row of buildings that I do remember, and realized the location was Boyle at Olive. What makes the intersection hard to place is not only the clearance of buildings, but the complete re-configuration of the intersection. Looking east on Olive just west of Boyle. The building on the southwest corner of the intersection was known as the Musical Arts Building long before becoming home to Gaslight Square venues and had been since at least 1909 as its name appears on the Sanborn map below. 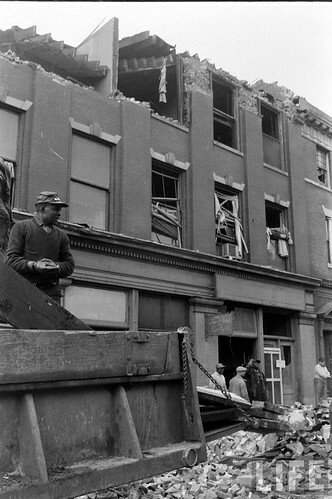 Damage to the Musical Arts building from the tornado was extensive, but not devastating and the building was repaired and put back into use. 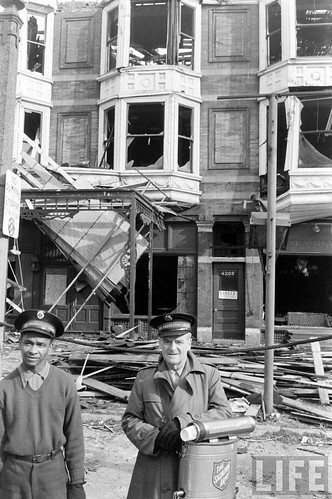 Just three years later on the night of January 10th, 1962, a major fire struck the Musical Arts Building. The photos above and below are from a Post Dispatch photo gallery of the enormous fire caused by a grain explosion at Ralston Purina's mill on Gratiot that occurred the same night. The building just west of the Musical Arts in the photo above was one of the first to go prior to the mass demolitions for Citirama and can be seen in my second Gaslight post in 2007. The aftermath of the fire left the building, sidewalks and street all coated in thick layers of ice. Like a cat with nine lives though the Musical Arts Building was re-built again. The building for many years housed the studio of artist Ernest Trova. According to the Post, the it was finally demolished sometime in the 1970's. As this 1909 Sanborn Map of Gaslight Square shows, originally Boyle and Pendleton each ended in T intersections at Olive about 260 feet apart. At some point however, possibly due to perceived traffic problems around Gaslight Square, Boyle and Pendleton were joined by the taking of several properties, clearance through demolition and construction of a curved connector. South of Westminster Place, Boyle remains a standard street with 36 feet of pavement (two 10' driving lanes & two 8' lanes). The new connector however was built with a whopping 50 feet of pavement or four 12.5' lanes. For comparison, standard lane width for interstates is 12'. 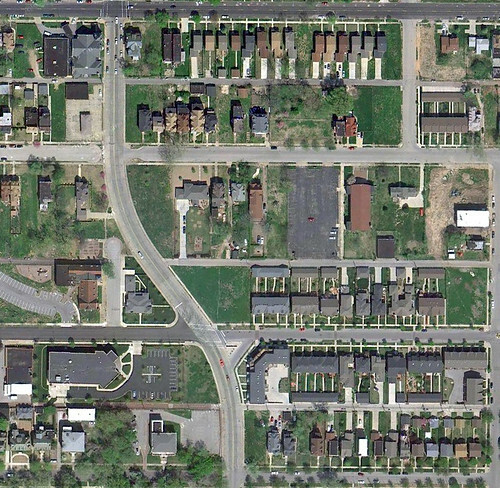 An aerial photo today shows the dramatic change that came with the reconfiguration of the streets. While a four way stop has been put in at Olive, the overbuilt infrastructure still has the feel of a high speed collector road in some far flung suburb. 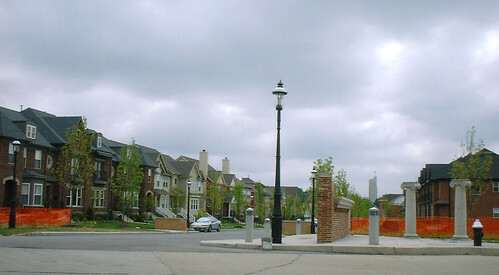 The architecture of the townhouses that have been built in the area, with the exception of a condo building at the southeast corner does not help the feeling of the road. 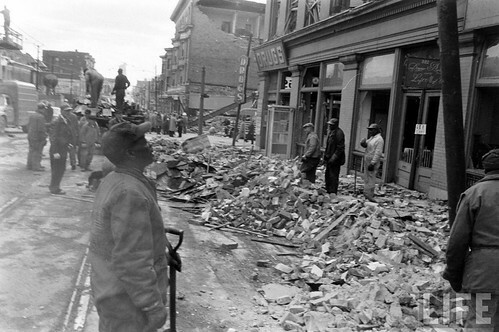 The building at the end of the T in the first photo survived the tornado, but as photos below from the Western Historical Manuscript Collection show, it was re-built as a stripped down ghost of its former self. The bays, while damaged, seemed repairable, but were stripped off along with the decorative brickwork only to be replaced with pairs of windows punched in a blank facade. Except fro a coat of white paint, the only thing unaltered was the iron canopy extending over the terrace. 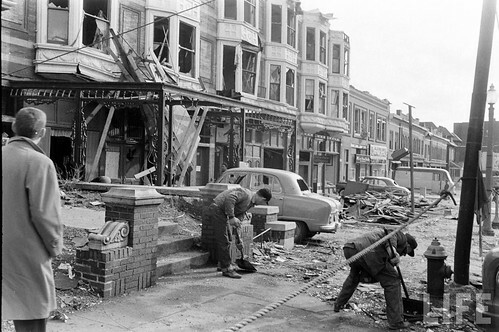 This building was demolished along with others for the reconfiguration of Boyle and Pendleton. Another view from the intersection looking east. The painted building in the center would survive until 2003. More photos of those can be seen in my first Gaslight Square post. The "new" Gaslight Square looking east from Boyle. Photo by Marjie Kennedy. A fairly attractive 3-story condo building has since filled out the corner behind the columns. 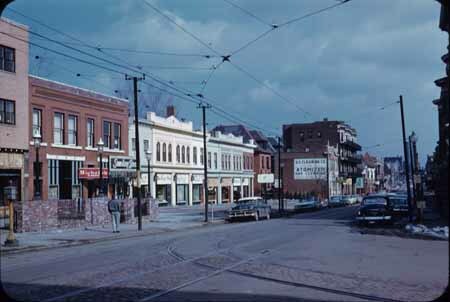 The only things recognizable from the old photos are the gas light poles and the Continental Building in the distance. The northeast and southwest corners of the intersection are still empty lots. Hopefully someday something worthy of this storied location will be built there. Reminder: Missouri Tax Credit Public Hearing Tonight! Just a reminder that Jay Nixon's Tax Credit Review Commission is holding a public hearing tonight from 3:00 to 9:00 pm at the Old Post Office at 815 Olive Street. Public testimony regarding the tax credits will be taken from 4:00-6:00 and 7:00-9:00, so you do not need to be present for the entire evening. 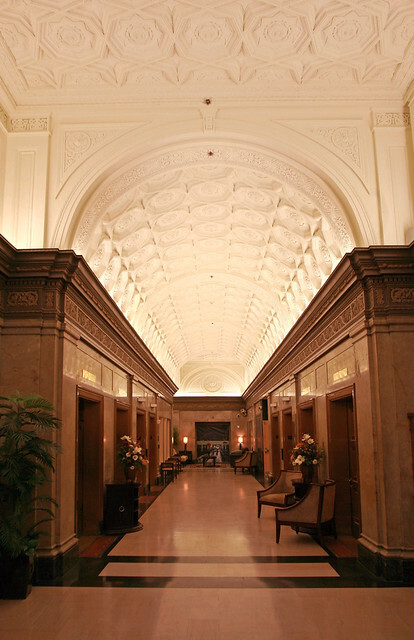 The photo above is of the restored lobby of the Paul Brown Loft Apartments, which are right across Olive from the Old Post Office. This building and dozens more would not have been restored if it was not for the Missouri Historic Rehabilitation Tax Credit. Like the Ambassador Theater Building and many others that were demolished before 1998, the Paul Brown could have very well ended up meeting the wrecking ball. Instead, it was renovated for a new use which with all of the other historic tax credit projects has brought a renewed vibrancy to Downtown St. Louis. Please consider taking an hour or two of your time tonight to come let the Tax Credit Review Commission know that Missouri should not cut Historic Tax Credits, but that we should continue to be a leader instead of the "show me" state. 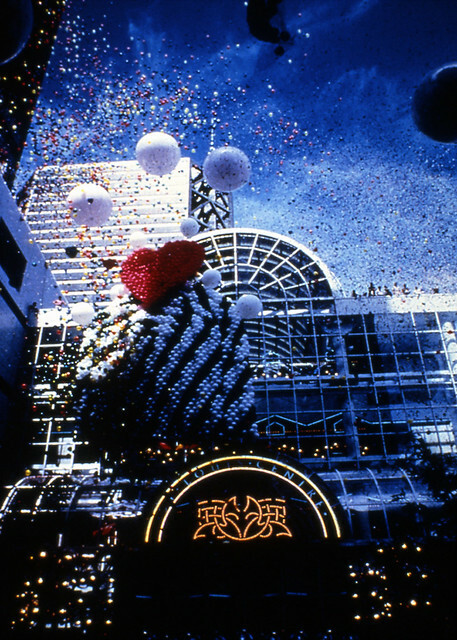 When St. Louis Centre finally had its grand opening after over a decade of planning in August 1985, there was great anticipation by the City's civic leaders that shoppers would return to Downtown St. Louis. For the first several years of its existence, they were right. The siphoning of shoppers away from Downtown to newer sprawling suburban shopping centers had been occurring for over three decades, and now the table had been turned. It had been almost 10 years since a major mall debuted in the St. Louis region (Chesterfield 1976), and most of the area's other major shopping centers were approaching 20-30 years of age and had lost their luster (Westroads: 1955, Northland 1955, Crestwood:1957, River Roads: 1961 South County 1963, Northwest Plaza: 1966, West County 1969). St. Louis Center was the place to shop whether you lived in St. Louis, its suburbs or were just visiting from out of town. 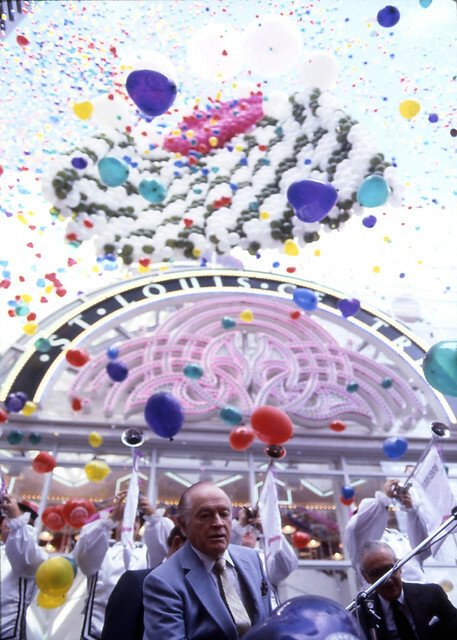 Comedian Bob Hope was featured at the opening festivities. When opened, St. Louis Centre was claimed to be the largest urban shopping center in the U.S. in retail square footage, rivaling even Chicago's giant Water Tower Place. A local reporter compared the mall to a luxurious "ocean liner" due to its almost all white interior and exterior finishes. The mall's enormous barrel vault skylights and walls of glass at the entrances reminiscent of the Crystal Palace or Milan's Galleria Vittorio bathed its interior with daylight. 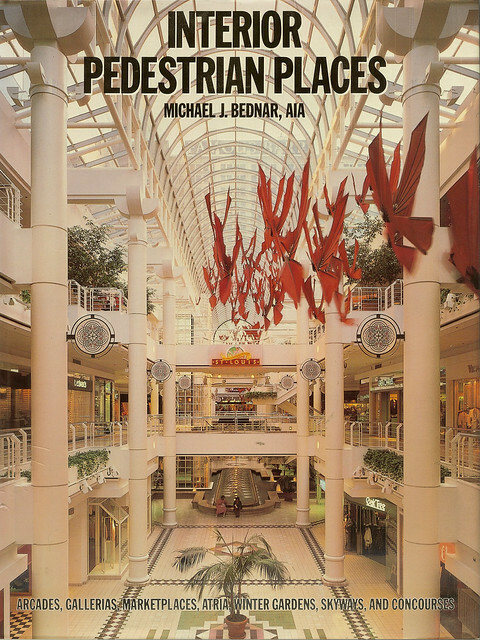 St. Louis Centre even made the cover of the book Interior Pedestrian Places, which features great public interior spaces throughout the world. 1985 was a year that had St. Louis flying on a high that was unmatched since the mid 1960's. Not only was the $95 million dollar St. Louis Centre opened, but Union Station, which had been closed in the early 1970's was renovated into a festival market and hotel by the Rouse Corporation. Between 1981 and 1985 St. Louis led the nation in the use of Federal Historic Tax Credits with $436 million in renovation projects including over 1600 units by the Pantheon Corporation in DeBaliviere Place and dozens of buildings in Laclede's Landing. A glowing article in Fortune Magazine lists these achievements and much more, declaring St. Louis "a place with a future". Many people have said that St. Louis Centre was detrimental to street-front retail in Downtown St. Louis. 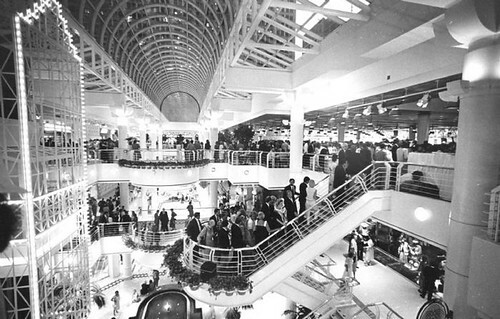 The vast majority of the stores that opened in St. Louis Centre however were new to Downtown St. Louis. Many including Abercrombie & Fitch, The Sharper Image and others were brand new to the St. Louis retail market. While the shoppers that patronized the stores in the enclosed St. Louis Centre for the most part did not did not add any vitality to the streets, it is hard to argue against the fact that the Centre attracted shoppers who had not thought about coming Downtown for years. Beyond the expansive skylights and bright clean interior, St. Louis Centre had many design flaws that did not help its fate. 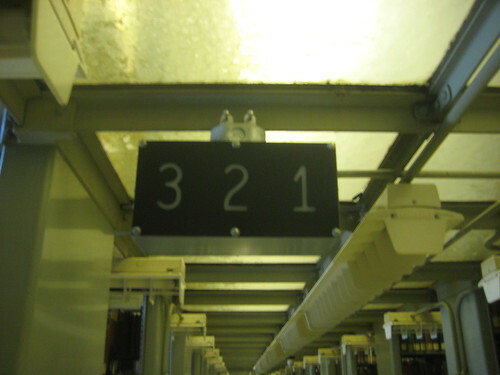 When the Mercantile Center was planned a decade earlier, the first main retail level was to be at street level, with all of the service areas and loading docks located out of the way in a basement level. This would have drawn a lot of cut-through pedestrian traffic. Instead, to cut construction costs, the large loading dock and service area of the mall was built in the middle of the ground level, forcing potential shoppers coming in off the street to go up the second level to the stores. There were a few stores on each end at street level, but sacrificing the center of the first floor to service areas seriously hampered the ability of the mall to be integrated with the streets around it or adapt to changing needs of the Downtown market. 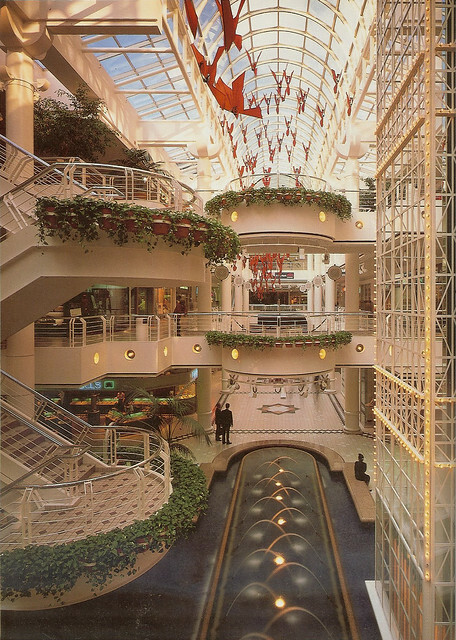 In 1986 the first section of the St. Louis Galleria opened in Richmond Heights, replacing the old Westroads Center. 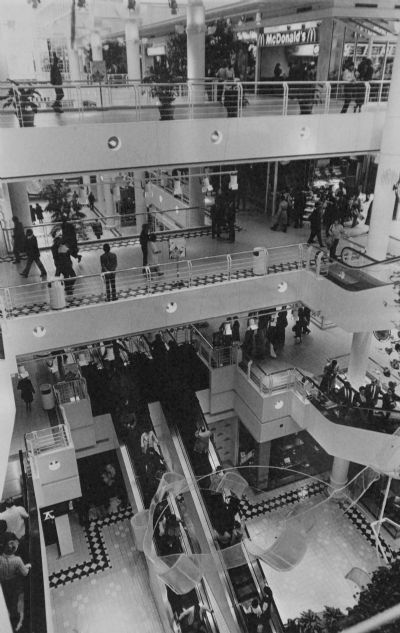 With only a remodeled Dillards in the original 1955 Stix Baer & Fuller and a relatively small number of stores, the Galleria barely made a dent in St. Louis Center's retail supremacy. Five years later in 1991 however the Galleria was more than tripled in size, with a new Famous Barr, Lord & Taylor and another 100+ stores, moving the region's retail center of gravity to Brentwood and Clayton Road. 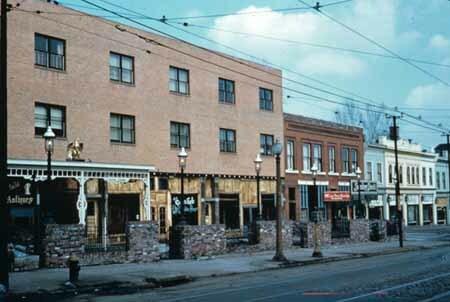 Even downtown Clayton, which had established a strong retail presence in the mid-1950's suffered. After the Galleria expansion opened, foot traffic and sales at both St. Louis Center and Union Station, which was reopened as festival market / mall just three weeks after the Centre, dropped significantly. Instead of encouraging people to stay Downtown to shop, busloads of conventioneers were regularly sent via charter bus to the Galleria. For St. Louis Centre, which had lost its newness factor, the future from this point on was only downhill. 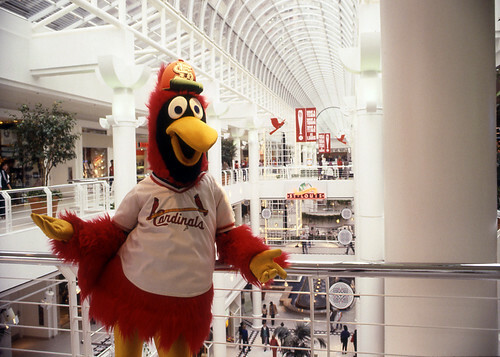 Even Fredbird thought St. Louis Centre was the cool place to be. Governor Nixon's Missouri Tax Credit Review Commission announced yesterday that one of five public hearings being held as part of its analysis of Missouri tax tredits will be held here in St. Louis on Tuesday September 21st. 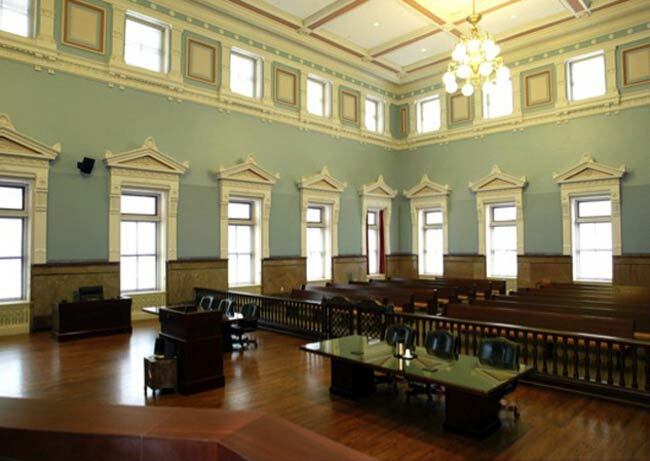 The beautifully restored courtroom above of the Missouri Court of Appeals at the Old Post Office - 815 Olive Street will be the venue for the meeting at which public testimony will be taken regarding the future of all Missouri tax credits including the Historic Rehabilitation Tax Credit. According to the agenda of the 6 hour session, two blocks of time from 4:00-6:00 pm and 7:00-9:00 pm will opened for public testimony. As most everyone reading this knows, the Missouri Historic Rehabilitation Tax Credit since its inception over 10 years ago has been largely responsible for the dramatic re-birth of Downtown St. Louis and the continued restoration of dozens of St. Louis neighborhoods. Nixon's Tax Credit Review Commission is under orders to look at all Missouri tax credits and establish a plan for drastic cuts by Thanksgiving. 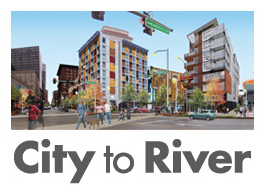 For the Historic Rehabilitation Tax Credit this could mean a lower cap, or worse, a limited allocation system similar to the Low Income Housing Tax Credit which would politicize the process and result in a dramatic drop in the number of buildings that are renovated along with the jobs and tax revenue that are created in the process. This would be a self defeating move for Missouri, but one that is very much on the table for implementation. This is YOUR chance to stand up and be heard. Please come to one of the public testimony sessions and tell the Commission that Historic Tax Credits are crucial to Missouri's economy and must not be slashed. 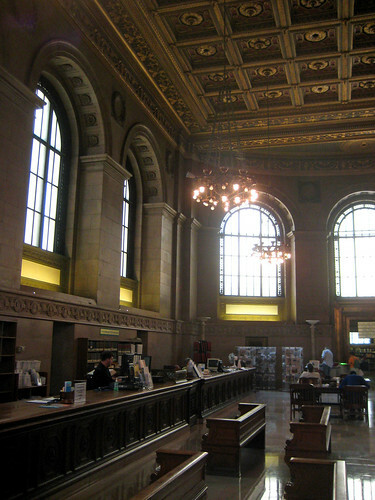 This past June the St. Louis Central Library designed by Cass Gilbert closed for a $79 million dollar renovation which is scheduled to be complete for the building's 100th birthday in 2012. The renovation will restore historic ceilings that were altered to install fluorescent and recessed can lighting, provide new HVAC and plumbing systems, introduce a new auditorium as well as several other improved spaces. The week before it closed I took a brief tour of the spaces beyond the bronze doorway at central desk of the great hall. Here was housed the central stacks that while generally closed to the public contained a structural system making it possibly one of the more interesting features of the building. 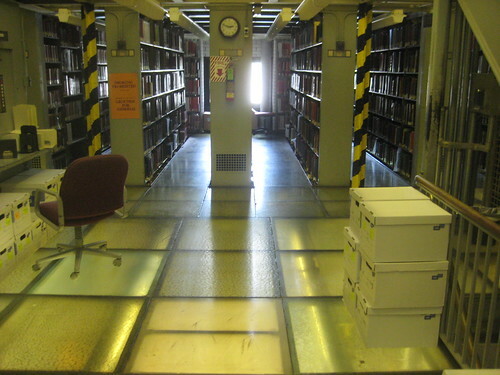 Upon entering the stacks you immediately experience that made this off-limits area so interesting, the glass floors! 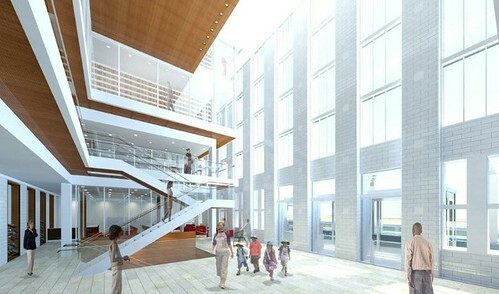 The glass floors were designed to let natural light from the exterior windows filter deep into the rows of shelves. 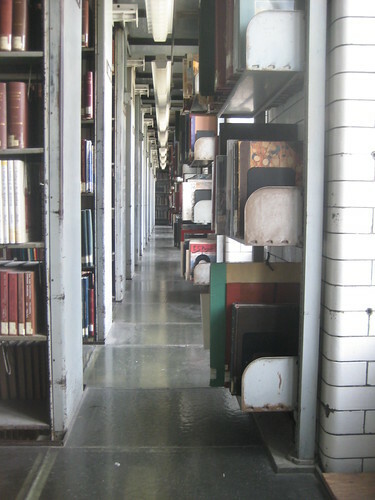 According to library history, when originally built the stacks had one light bulb for every other row of shelves, which meant that making every allowance for day-lighting was of great importance. 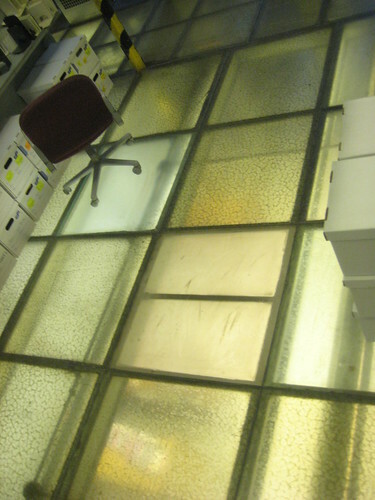 The thick glass slabs are supported on a grid of steel Ts and angles. An engineering feat themselves, the stack shelves rise the full 7 levels of the stack tower and support the glass and steel floors at each level. 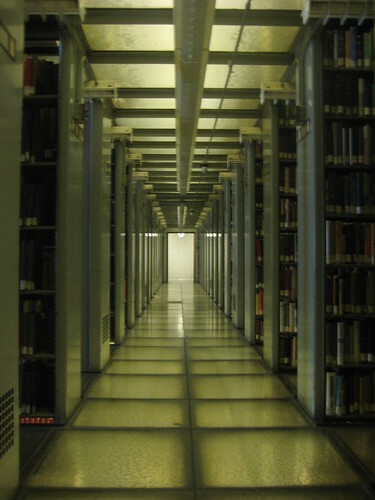 While unique to St. Louis, the Central Library's system of glass floored stacks was used in many larger municipal and university libraries in the late 19th and early 20th centuries. 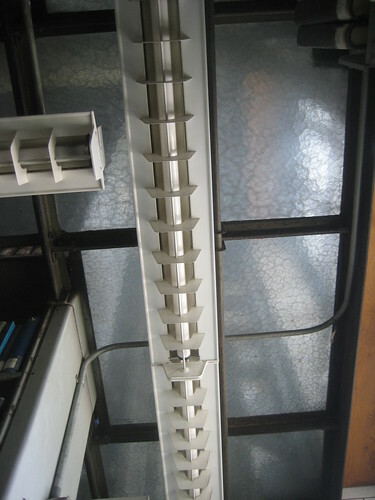 The fluorescent lights near the exterior wall are left off during the day as daylight fills the aisles. 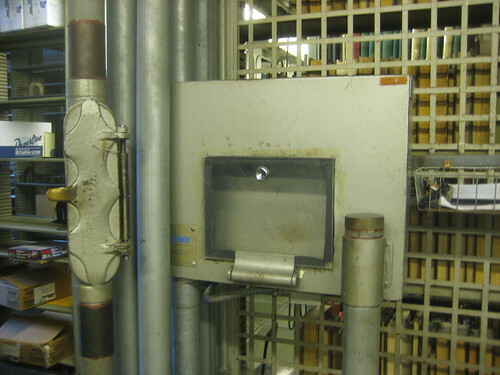 Unfortunately with the Central Library's renovation this intriguing feature will be removed to open up the former stack space for a new atrium and entrance facing Locust Street. The library already has two original accessible grade level entrances on Locust Street, so why a third is needed is to me beyond comprehension. 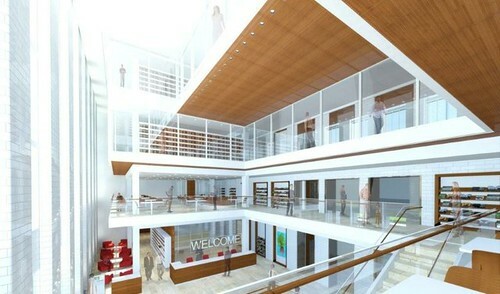 Two renderings show the new atrium and entrance that will replace the stacks. The Central Library's great hall. With an amazing space like this, who needs a new atrium? Those who argued for eliminating the old stack tower say that the stack tower was a fire hazard. 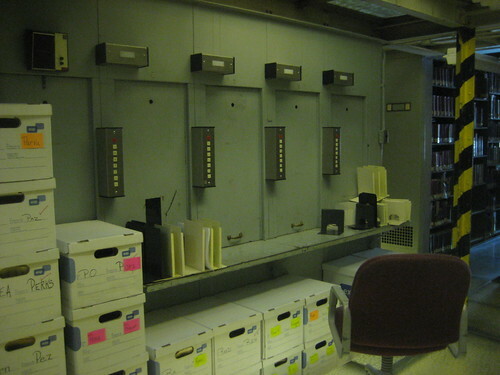 While the design of the stack tower with openings between floors could be an issue, any time you have a high density concentration of books, you have a potential fire hazard. Employment of modern fire suppression systems are the safest and best way to prevent devastating fires. 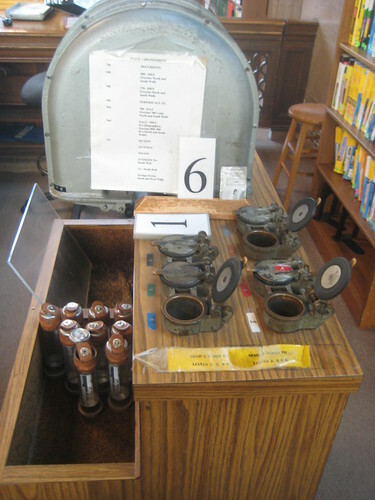 Another feature of the Central Library that will disappear with the stacks is the pneumatic tube system. 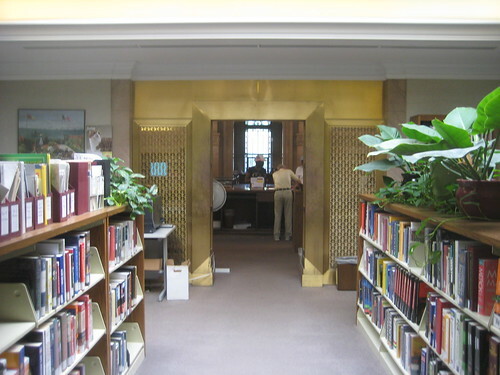 Requests for books were presented at the central desk in the great hall and sent via the pneumatic tubes to the stacks where librarians retrieved the books and brought them to the patron at the desk. I can understand that this system requires more employees to keep running and that there are probably other benefits to an open stack system, but having someone else find your book was pretty nice. Librarians: please weigh-in. These dumbwaiters were used to ferry piles of books back to their appropriate level for re-shelving upon return. They will also be removed with the stack tower. Below is a video from KETC Channel 9's Living St. Louis series that gives a good synopsis of the Central Library's history and features. Near the end of the video are a sequence of historic photographs showing the construction of the seven story stacks and glass floors. If you could play this in reverse you can imagine how the demolition crews equipped with cutting torches will soon disassemble the stack tower, cutting the steel into pieces, tossing the glass into a dumpster and destroying this unique structure (for St. Louis) forever.